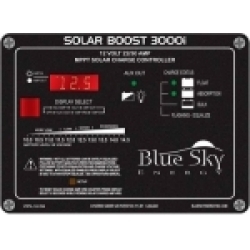 Blue Sky Energy’s Solar BoostTM 3000i solar charge controller charges 12V batteries at up to 30 amps from conventional 36 cell 12V PV modules. Patented MPPT technology operates the modules electrically in a manner that harvests all available PV power and can increase charge current up to 30% or more compared to conventional PWM type controllers. 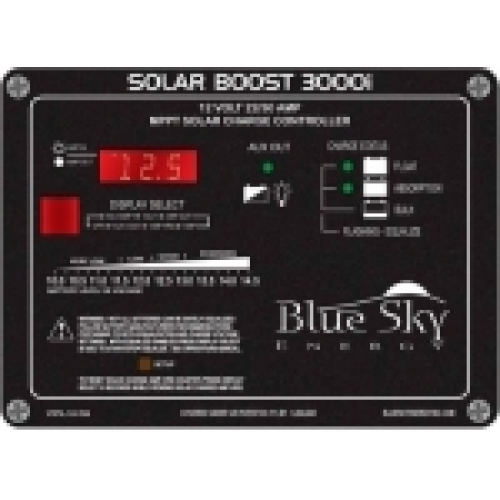 Solar Boost 3000i may also operate as an IPN Network Master controlling up to 7 remote Blue Sky Energy IPN compatible charge controllers such as the SB3024iL. Blue Sky Energy’s IPN Network allows multiple charge controllers to communicate with each other and coordinate their activities to charge the battery as a single coordinated charging machine. All networked controllers display through the SB3000i’s digital display and may share a battery temperature sensor, IPN-ProRemote display for high accuracy battery system monitoring, or Universal Communication Module (UCM) for remote access over the Internet.